photo is faded, washed out, doesn’t match clarity of picture frame, rough, cut out edges on head. Does this look like a real picture in 2013? Not to me. Yet another chapter in the Amanda Todd led-bullying fakery psyOpera. Interesting choice of first names – Todd, to create linkage to the previous major hoax. Kim Loik says she told her 15-year-old son Todd to ignore the bullies and the constant barrage of insults they were sending to him on Facebook and through texts on his cellphone. On the night of Sept. 8, he received another taunt, she said. “I told him to go to bed and not worry about it,” his mom recalled Wednesday, though sniffles and sobs. 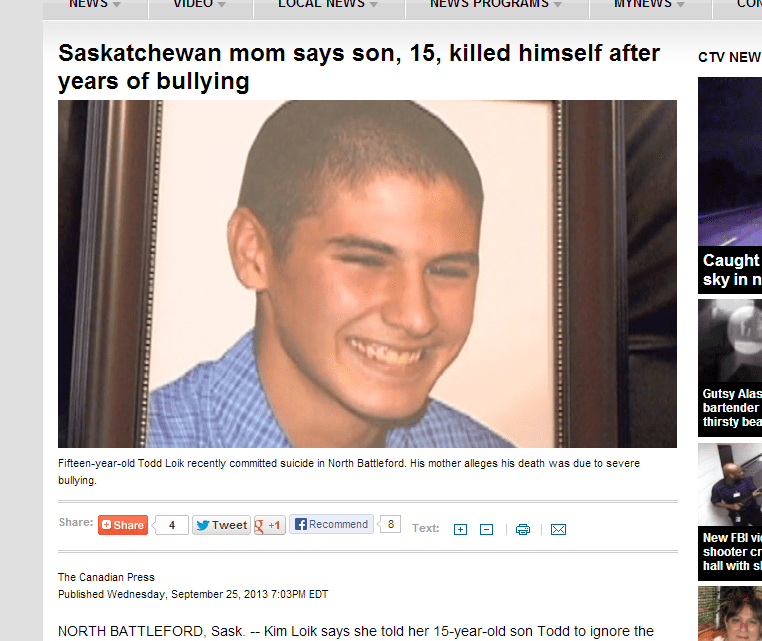 via Saskatchewan mom says son, 15, killed himself after years of bullying | CTV News. This entry was posted in Psyops and tagged amanda todd hoax, todd loik bully hoax on September 25, 2013 by ab.